You're ready to launch your first drone complete with camera. Of the hundreds of options out there, which drone would be best for you? After researching, we’ve come up with ten reviews to help you find the best beginner drone with camera. Plenty of high tech, easy to fly drones are available, as you’ll see from our camera drone buying guide. 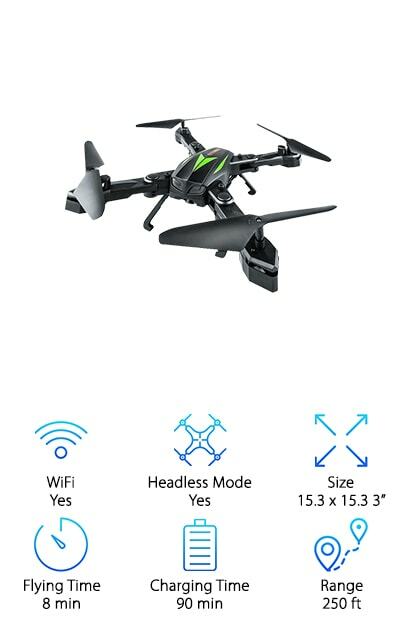 Before we get started, you’ll want to check these specs when shopping for the best starter drone with camera. WiFi: Many drones are available that allow your camera and smartphone to communicate. With WiFi, you can watch a live stream of video your drone takes while it’s still in the air. We’ll let you know which drones support this option. 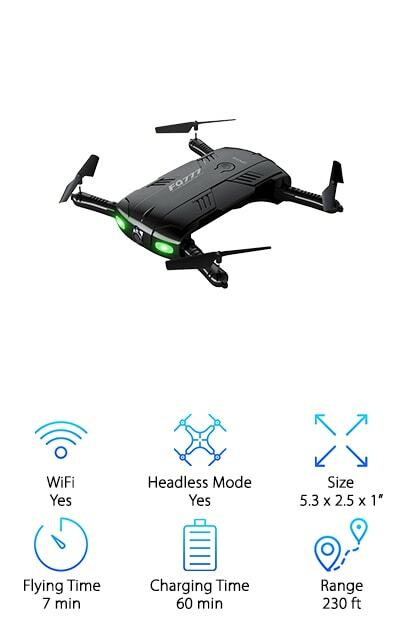 Headless Mode: A drone in headless mode is directed relative to your position rather than its own. For example, when you push forward, it will go straight before you regardless of the direction it faces. This is especially helpful on beginner drones. Size: You’ll want to know how large a drone is before you consider purchasing it. After all, this will affect how you’re able to use the product. You will also find that fun, cheap mini-drones make great drones for beginners. Flying Time: The length of time a drone can stay in the air varies, especially for drones with camera and GPS, as the slight extra weight must be considered. For maximum enjoyment, you’ll need to know what to expect from each machine. Now to choose from among the 10 best drones for beginners and begin the adventure. If you’re in a hurry to get started, take a look at our top pick and budget pick. These cover our all-around favorite drone with camera for sale and the best affordable drone with camera. If these don’t offer exactly what you’re looking for, we have reviewed eight other really good drones with camera in this list. This should be easy. Ready, set, let’s fly. Our top pick is the Holy Stone F181C Quadcopter Drone. 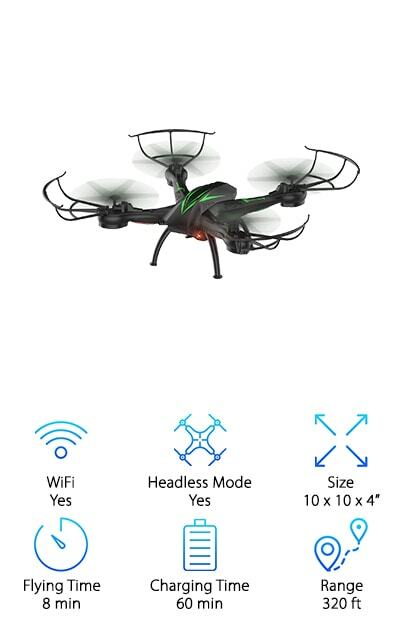 This is an exciting drone equipped with an HD camera. 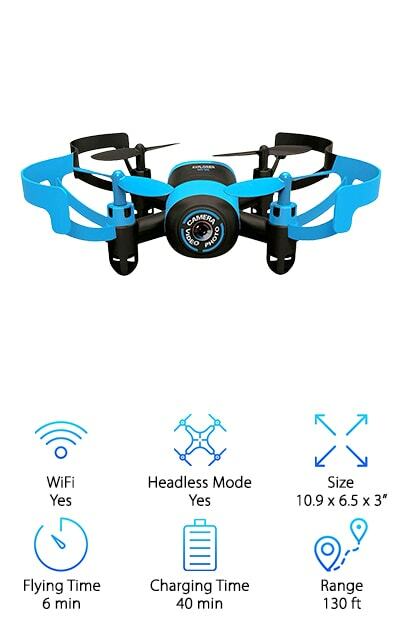 Simple enough for a beginner, the Holy Stone Quadcopter offers incredible options that will make you look like an expert. One feature we love is the 4-speed control mode that allows you to adjust how quickly the drone flies. Start off slow and try more speed as your confidence grows. With the push of a button, you can watch your drone perform a complete 3D roll in any direction. Release the throttle, and the Holy Stone drone will hover, thanks to an updated altitude hold function. This drone also features headless mode, which orients the copter to the operator, making it easier to direct for some players. Even better, it has an automatic return to home button which will keep you from losing the drone while you’re learning. This is definitely one of the best remote-control drones with camera available. The Cheerwing Syma Drone offers some amazingly cool features at an inexpensive price, making it a must for a beginner drone review. This sleek drone can be set to low-speed mode when you're just learning to fly it. As you become more adept at controlling it, the Cheerwing Syma offers a further challenge when you switch to high-speed mode. This is an easily controllable beginner drone that still offers plenty of zip. You can also quickly learn to perform exciting stunts with this drone, such as 360-degree 3D rolls and other impressive maneuvers. 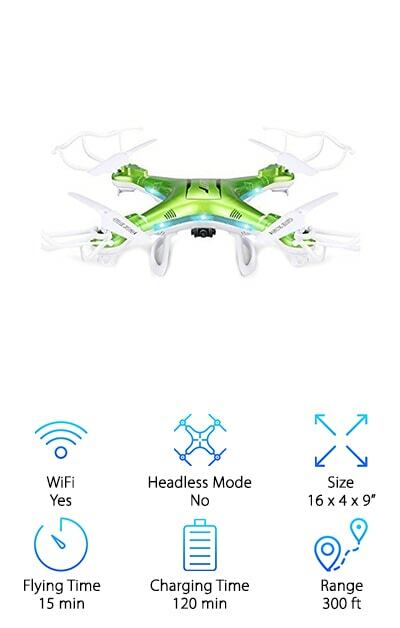 The headless mode feature allows you to control the drone even when you can’t tell which direction it’s facing, so you’re less likely to lose it. An attached camera can be connected directly to your phone for real-time video and photos. Want to know the best part? The Cheerwing Quadcopter is incredibly durable. It will hold up under a lot of rough and tumble beginner moves. The DBPPOWER MJX is another terrific drone for beginners. 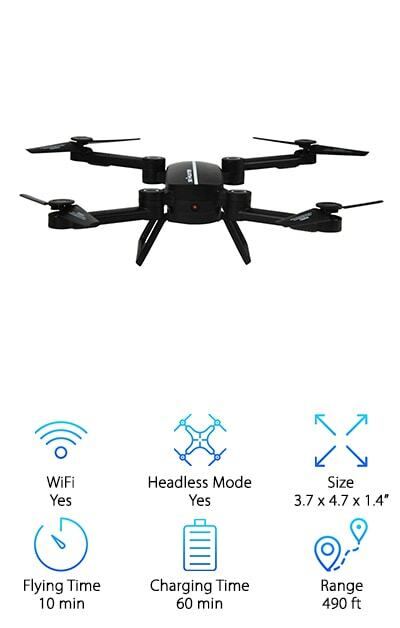 With its impressive range of over 320 feet, you’ll be glad to know this drone features a headless mode option, which orients the drone to the controller and makes it easier to direct, especially for beginning operators. With both high and low-speed modes, this drone will help you move quickly from beginner to expert. 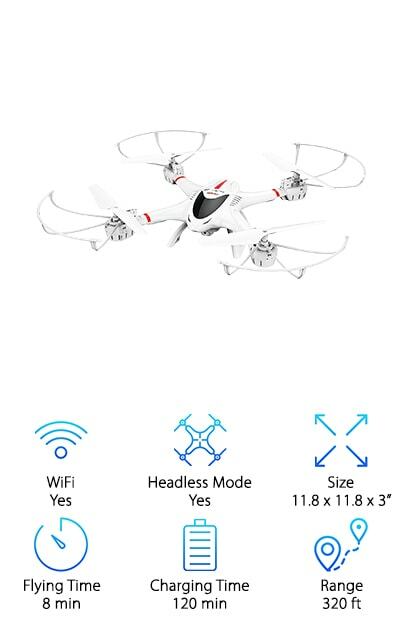 Learn your moves or operate indoors on the low-speed setting, and then step it up and enjoy the exciting speed and maneuverability this drone offers. Bright LED lights make for safe and flashy night flying. Equipped with a Wifi HD camera, the DBPOWER allows you to use your phone to shoot video and take photos in real-time. Your footage will be stored on your connected device, so it’s easily shared. One last thing: this drone features a one-button automatic return to home, so you will be less likely to lose it as you learn to fly. As a beginner drone operator, you’re sure to experience a few crashes. For a drone that will bounce back without any trouble, try the QCopter Quadcopter. This drone is about as durable as they come and has prop protectors to minimize damage. Even better, your purchase of this drone also includes a crash kit full of extra parts and a repair instruction video. Other instruction videos and support options are also available, making this a terrific choice for beginners. And here’s the kicker: 30 minutes of flying time! That’s hard to beat. The QCopter comes with two batteries, and each one will give you about 15 minutes of nonstop flying time. Though you will be fully prepared for crashes with this drone, you actually may not have as many as you expect. The QCopter is easy to fly and has a very stable design, as well as an altitude hovering feature. You’ll be flying like a pro in no time. This easy-to-fly mini-drone is tons of fun! Very lightweight and durable, it's also a perfect drone for beginners to learn on. For more control and safer flying, you can start out with the low-speed mode and get accustomed to steering the drone. 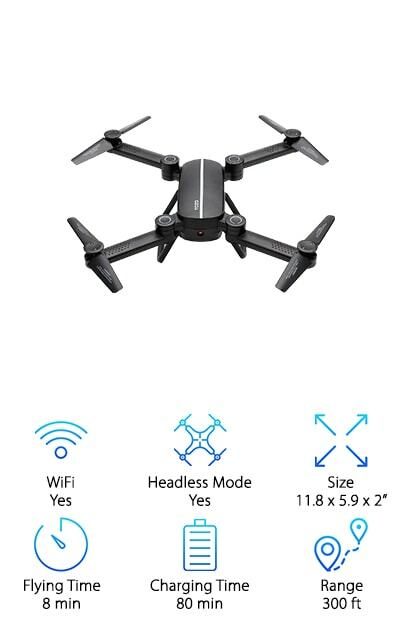 This drone is also equipped with headless mode, which makes it easier to direct when it's too far away to tell back from front. And check this out: The Mini RC has built-in air pressure sensors which allow you to set it to hold a certain altitude. Once you feel confident in your abilities to control this drone, you can switch to high-speed mode to watch it zip around and start working on some stunts. The Mini RC Drone comes complete with a camera, which you can use to stream real-time video and take pictures directly to your phone. From there, you can easily post your adventures online or share them with your friends. The TOZO Q1012 is a super cool little drone with plenty of fantastic features. It's easy enough for a beginner to learn with, yet offers some fun features you'll enjoy as an experienced flyer as well. This drone is steady in the air, with three-speed levels that are perfect for learners and experts alike. You can shoot high-quality photos and videos with the built-in FPV HD camera while the drone is in flight. The TOZO Q1012 can also be set up to be controlled directly by your phone. It responds quickly and smoothly to the controls, which is a must for both beginners and experienced fliers. A couple other excellent features are the one-button take off and emergency landing controls. These make getting your drone into the air and bringing it down when you're about to lose control super easy. To top it off, this compact drone can be folded up neatly and carried with you wherever you go. The Akaso Quadcopter is a steady flyer that is easy to direct, using either your phone or a remote control. In Gravity-Sensor mode, the drone will even follow the up and down motions of your phone. Execute 360-degree flips and rolls with minimum experience thanks to a stable 6-axis gyro system. 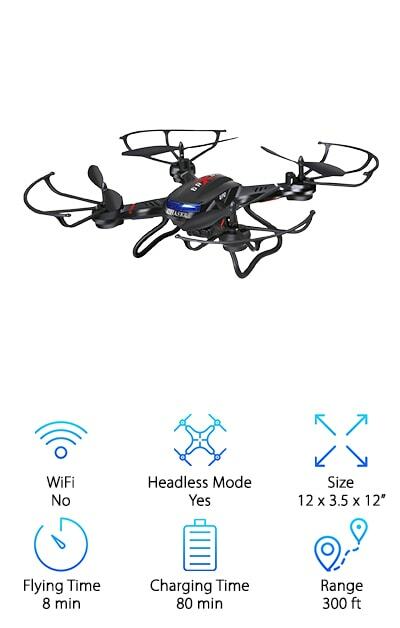 This is a fantastic drone for beginners. It includes three-speed options, a one-button take-off option, and a one-button return to home feature. Once you've connected it to your phone, you can even draw a flight track for the quadcopter to follow, using the track-controlled mode. A built-in barometer provides an altitude hold function which makes for easier, steadier flight. The built-in HD camera lets you view high-quality live video and pictures, which you can then store or share from your connected device. The drone's foldable design makes it easy to store it safely or take it with you anywhere. Bottom line: this is a strong, budget-friendly beginner option. Experience the fun of flying in a whole new way with the Wobox RC Drone. This tiny flyer can be controlled directly from your phone (though it does also come with a remote). It responds promptly and smoothly to the whichever control you choose to use. A gravity sensor even allows you the option of directing the drone by moving your smartphone. Another great function is the altitude mode, which causes the drone to hover at its current height. This makes it easy to capture clear, steady real-time video and images with the built-in 0.3MP HD camera. Beginners will especially appreciate the one-key return to home feature, as well as one-key landing and emergency shut-off. If you’re about to lose control or crash the drone, you can push both levers at once to shut it off and bring it to the ground. The drone’s foldable, flexible design and durability also makes it an excellent choice for players on the move. This palm-sized pocket drone is packed with notable features that are perfect for beginning pilots. The controls are super easy to understand, as they have the different functions printed right on them. The remote control also has a holder for your mobile phone so you can view real-time video taken by the mini drone's built-in action camera. An adjustable camera also makes sure you get the perfect shot for good-quality still images. This little drone offers stable, fast flight, with three-speed modes for pilots of varying experience. 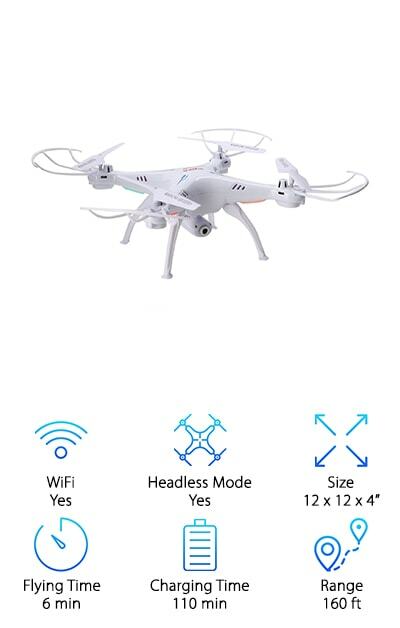 It features one-button take off and one-button landing, as well as a one-button return to home option in case you lose track of the drone while learning to control it. The altitude hold function makes it possible for you to release the throttle while the drone hovers at its current height. One final feature we love: Bright LED navigation lights make night flying easy, safe and fun with this cool mini-drone. One of the Beebeerun FPV Quadcopter's best features is its incredible durability. This makes it a perfect mini-drone for beginners. It's made of light, flexible ABS material that is virtually indestructible. The drone has passed the crash, drop, bend and press reviews and has come through them unscathed and fully operable. You can expect steady, straightforward operation from this drone. It also offers an excellent variety of one-button moves including one-key take-off and landing, one-key stop, one-key return home and one-key 3D roll. The drone can be connected to your phone, so you can view video taken by the built-in camera while the drone is in flight, giving you a bird's-eye perspective. You can also control the drone with your phone due to the gravity induction feature. It’s also compatible for use with a 3D headset. With an impressive range and flight time for such a tiny drone, the Beebeerun FPV is another excellent option for a beginner flyer.